In 1848, the incoming horse brigades came from right to left over Lake Mountain in the centre of picture, and up Anderson River to the top of the mountains to the left. This rough trail, explored by Anderson in 1847, was abandoned by the fur traders in 1849. 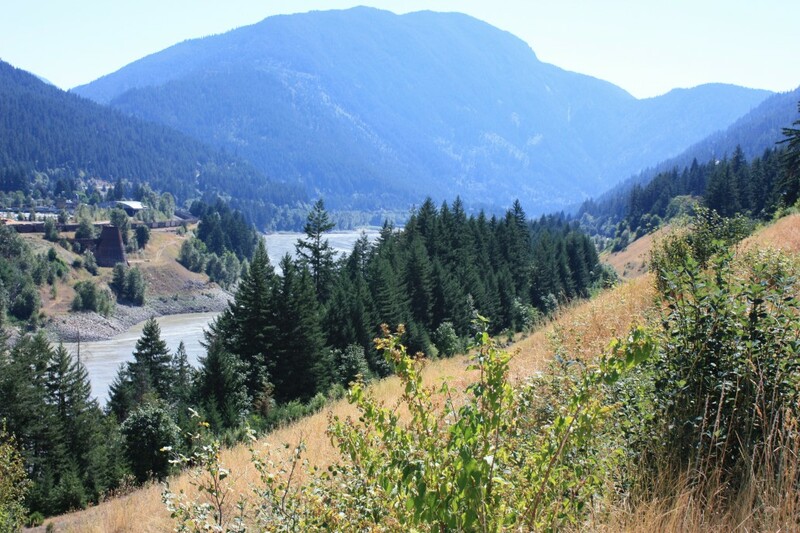 In 1846 and 1847, Alexander Caulfield Anderson explored four routes across the mountains that separated the HBC fort at Kamloops, from Fort Langley on the lower Fraser River. In 1848 and 1849, the fur traders were forced to use his trails before they were ready. War had closed their old Columbia River route, but the HBC men still needed to bring their furs to the coast, and return to the interior with their trade goods. If the furs failed to make it to the London fur sales the Company made no money and no dividends were paid. If the trade goods did not make it into the interior posts the fur traders could not trade for the furs and the Company, once again, made no money. As you can see, the brigades, and the brigade trails themselves, were very important to our early British Columbia history. In these explorations, Alexander Caulfield Anderson was looking for horse trails. Boats might have served the Company’s needs had the rivers been smooth enough, but numerous fur traders had already proven the difficulty of traveling up and down the Fraser, and Francis Ermatinger had explored and eliminated the Lillooet River as a possible boat route to Fort Langley. It is likely Anderson knew this even before he explored it for a second time. In the first year of Anderson’s exploration there had been a heavy rainfall and rivers were high — in the second there was a drought and the Fraser River might have been lower than normal. While the fur traders did worry about the spring and early summer “freshets” — higher river waters from melting snow — Anderson did not take into consideration the effect of a drought on the Fraser River. He might, in fact, have been more or less unaware of the drought. I am discussing two things in this post, both relating to the horse brigades. First, the structure of a brigade of two hundred or so horses; and secondly, what the requirements of a trail for heavily loaded pack horses were. For more information on the location of the many brigade trails in British Columbia, read this post: http://nancymargueriteanderson.com/brigade-trails/ There is also some information on the structure of a brigade trail in that post, that might be duplicated here. So let us talk first of how a brigade was made up. The first time Anderson saw a horse brigade was 1835, when he accompanied Peter Skene Ogden into New Caledonia. At Okanogan House, where the Okanagan River flowed into the Columbia, the brigade men left their boats behind and climbed onto the horses that had been left in the spring at Okanogan. Here is how I describe a brigade in The Pathfinder: A.C. Anderson’s journeys in the West. At Okanogan, the new horses [traded from the Nez Perces] were gelded, and the packhorses that had carried the brigades south in May were captured and hobbled. On the morning of departure, the voyageurs loaded the 200 horses of the brigade, broken and unbroken alike. As was usual for the gentleman in charge of the brigade, [Peter Skene] Ogden rode at the head of the column. Immediately behind him rode the employee assigned the job of maintaining communications between Ogden and the various brigades that followed. Following the cluster of gentlemen and horses at the head of the column trotted the packhorses carrying camp provisions and leather tents, in the care of two men. On arrival at camp, these men quickly unloaded the goods and turned their horses loose to graze. Then, with flint and steel — matches were used only to impress the Natives with the power of the white trader — they lit the fires and put supper on to cook. Behind the provisioning brigade trotted the individual brigades of heavily loaded horses. Each string of seven to nine horses was under the care of two men responsible for the horses and their loads. Loading the packhorses began at four o’clock in the morning and was not usually completed before nine o’clock. The brigade travelled about 15 miles a day, and the pack day, or hitching, ended before dusk so the men could set up camp in daylight. Travel in an HBC brigade was a dusty and noisy affair with the neighs of horses, the colourful oaths of the men, the jingle of the pack bells and the constant rattle of hooves. At this point they were travelling up the old Okanagan trail which had been established for many years. In fact this route had changed many times over the years, avoiding the rough North Thompson plateau and its bog, the cliffs along the North Thompson River, and the muddy shores of Lac Vaseux. Because of the threat of a new boundary line that would, in all likelihood, separate the New Caledonia fur traders from their headquarters on the Columbia River, Anderson was instructed to find a new trail between Kamloops and Fort Langley, on the lower Fraser River. This, from The Pathfinder, was what he was looking for. Besides consideration regarding the route itself, the Hudson’s Bay men had developed strict requirements for an overland brigade trail, based on experience, good and bad. The Company was looking for a trail that hundreds of horses could travel safely without injury. A path that might work for a man on foot would not necessarily work for the heavily loaded packhorses. Sharp rocks on the trail bed would damage the horses’ delicate hooves and cut their fetlocks. If the ground was too soft, the passage of so many horses would turn the trail into a quagmire that later brigades could not cross. Safe fords over rivers and creeks were essential, especially as so much of the travel was done in early summer, the season of high water. Gradient was important, but they could accept a steep slope if the hillside allowed room for switchbacks. The horses needed food and water, and trail builders could sow alfalfa and white clover along the edges of the horse road if the ground was good, but they could not manufacture streams. Anderson would have to keep all these concerns in mind as he explored the potential brigade trails. So here we have a picture of a normal brigade, and the requirements the HBC men had for their brigade trails. Natives travelled over their country in ways that differed wildly from the fur trade brigades — Pahallak and other Sto:lo men rarely if ever travelled on horseback. It was therefore not unexpected that Anderson was led by his Native guides over many routes that clearly, to him, would not work for the HBC brigades. All of this information was needed for the writing of my first book, The Pathfinder: A.C. Anderson’s Journeys in the West. The book is still available here: http://www/heritagehouse.ca/author_details.php?contributor_id_1=2447 I also have copies for sale. My second book (Working Title: “York Factory Express”) is now at editor. But the information contained in this post will be a part of my next book — Working Title: “Brigades” — which will tell the stories of the New Caledonia brigades over the years. I am excited to say that I have already begun writing it! Copyright, Nancy Marguerite Anderson, 2014. [Updated Augut 26, 2015] All rights reserved.